Fall is coming! Interested in seeing the fall leaves change color? Well, toward the east, the White Mountains offer one of the earliest glimpses of color in the state of Arizona, due to their elevation of 11,000 feet. Leafing is best during early October (generally the first three weeks), and while the area is known for plenty of pine and fir trees, it is speckled with a healthy dose of Gambel Oaks, which turn a gorgeous yellow-orange sunburst, and aspens which offer a bright greens that turn into brilliant yellows. The Show Low, Pinetop-Lakeside, and Greer communities are among those around the range with their own beautiful forest drives, and Greens Peak off Forest Road 117 north of State Route 260 between Sunrise Park Resort and the town of Greer, offers a bird’s-eye view of the expanse of trees below. Blue Vista Viewpoint and the areas around Alpine and Big Lake are also great lookouts, the latter is off State Route 273 south of Eagar. Depending on stops and ultimate destinations, the drive east can take anywhere from four hours to five and a half. Go to www.azwhitemountains.net for information on the range and its surrounding communities. Check out The Ranch at Southfork cabins. 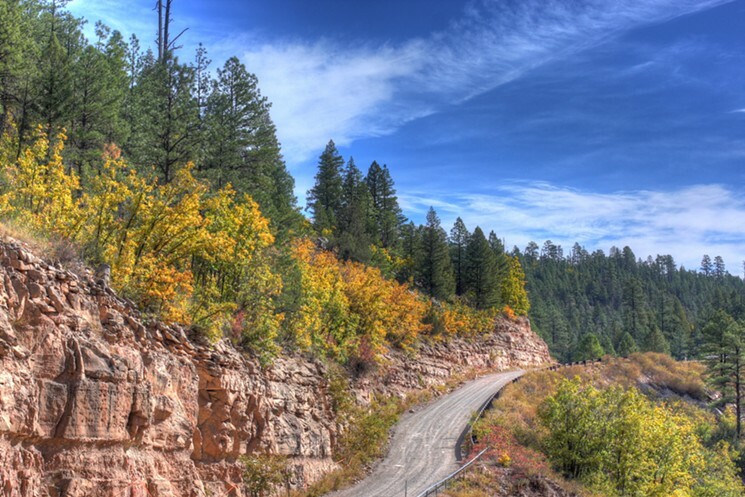 The perfect get away to experience the beauty of fall in Arizona!